Do you have expensive prescriptions? Do you have prescriptions that aren’t covered by insurance? What is a Prescription Savings Plan? Drug pricing can vary greatly from one pharmacy to the next in the US – and most Americans don’t even know it (oh, that’s just great!). In a nutshell (click here for more detail), a Prescription Savings Plan or Prescription Discount Program gives you access to lower pricing on some drugs at various pharmacies. 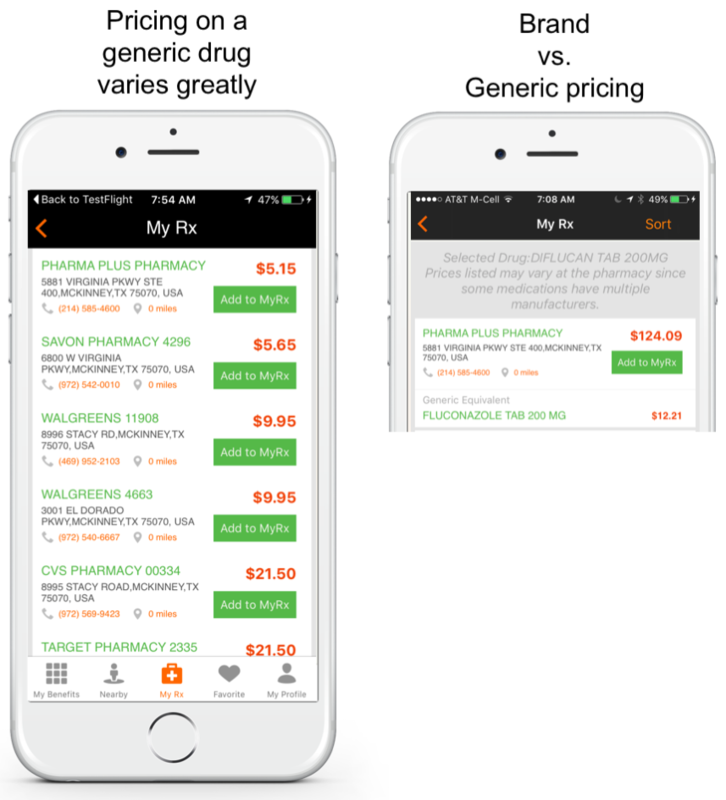 Some have pricing tools that allow you to view pricing on your drug at each pharmacy in your local area. LOW COPAY: If you have insurance, some plans offer a low $5 co-pay on a range of common drugs. In this case, skip the savings plan, and happily pay the $5 :-) NOTE that if your co-pay is higher, you might still save using the program. CHA CHING: YAY! On many drugs, not only is there a big discount from the retail price, but there can be a LOT of fluctuation in price between stores. In reviewing medications in a price look up system, I’ve seen them fluctuate from $150 at a pharmacy on one corner to $4 just down the street. For reals! The freshbenies prescription savings plan is a good idea for your family if you have prescription(s): 1) that are expensive and only partially covered by your insurance; 2) that aren’t covered by your insurance; 3) but no insurance. Call Member Services. Our team is standing by to help you find the best pricing on your Rx in your local area, so call us! Flash your card at the pharmacy. If you don’t have time or forget the first two points, just flash your card - a physical freshbenies card or the app’s virtual card - at the pharmacy when you pick up your Rx. The pharmacist will calculate the savings and tell you whether your freshbenies or insurance price is better. You can’t “double dip” and use insurance AND your freshbenies Prescription Savings Program – it’s one or the other. As I said, it’s always a good idea to tote your insurance info AND freshbenies member info. Then, you can look up pricing beforehand or ask the pharmacist to determine which gets the better price. Here’s my real-life story: I used my freshbenies telehealth service for a common medical issue and the doctor called in a prescription to my local pharmacy. When I went to pick it up, I learned the cost was $124. What? My insurance doesn’t pay until I hit my deductible, so the cost was 100% out-of-pocket. I went to my freshbenies appto look up the prescribed medication and found that there was a generic option for $12 at a different pharmacy right up the street from my house. Again, WHAT? I called the telehealth service to ask them to call in the generic option to this new pharmacy and proceeded to pick-up my $15 prescription! Side note: I learned that the freshbenies telehealth service always sends a brand AND generic drug prescription to your local pharmacy. Here’s my learning: When your doctor is prescribing a drug for you or a family member, have your freshbenies app at the ready! Look up the exact drug to see if there is a generic option and to see which pharmacy has the best price so you can have your doctor send the prescription to the best-price location! "With insurance, my monthly prescription was $88, but with freshbenies it's only $48. The first time I used my freshbenies card, the pharmacist was skeptical and assured me that nothing was going to be cheaper than using my insurance. I asked her to run my freshbenies card anyway and when the total came out $40 cheaper she was so impressed she asked me how you get freshbenies!" Healthcare and prescription pricing will continue to increase and insurance just won’t pay for what it used to. It’s important to find ways to be a better healthcare consumer. I hope you use freshbenies to become a better consumer, and control your healthcare dime, time and peace of mind! Now it’s your turn! Have you saved with an Rx Saving Program? Do you have questions? Feel free to post them in the comments below or email me at heidi@freshbenies.com.